Here are five movie quotes that I actually say in real life. And I've included the videos in case you don't remember them! 1. "Quick! Like a bunny!" Fear and Loathing in Las Vegas (6:04) I literally say this every day. Every. Day. To my son, coworkers, other drivers. My sister says it now and didn't know it wasn't something everyone said. Just me, I guess. 2. "Never say never." An American Tail I loved this movie when I was a kid. I could never get over the duplicity of this statement though. 3. "Curiouser and curiouser." Alice in Wonderland (5:38) This one is classic. And surprisingly fits into many situations. 4. "I'm not even supposed to be here today!" Clerks (11:18) Haha This one cracks me up every time! 5. "If I'm not back in 10 minutes call the police." Half Baked (9:05) I mentioned before that Ive watched this movie, but I didn't describe the love. The total love. There are many other quotes from this movie, but this is the one I use as if I made it up. 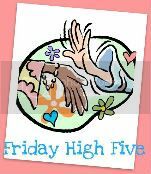 There's my Friday High Five. You should play along with me over at Angela's! I quote movies all day, every day. This is a fun post too! We are so fun tonight! :D I might have to copy this topic one day. I'm not even supposed to be here today. LOL that movie is so over the top. Especially when he starts yelling at her when she walks across the parking lot. I'm wondering if "Quick! Like a bunny!" would work on my boys in the morning. I will definitely try it! I say, "Curiouser and curiouser!" often to the boys when things happen around the house and NO one wants to take the blame. It JUST happened and NO one did it!! Have a great weekend! I agree with everyone else - what a great idea for a post! Thanks for sharing 'em!